The system directly reads brain signals to drive a cursor moving over a keyboard. In a pilot experiment conducted with monkeys, the animals were able to transcribe passages from the New York Times and Hamlet at a rate of 12 words per minute. Other approaches for helping people with movement disorders type involve tracking eye movements or, as in the case of Stephen Hawking, tracking movements of individual muscles in the face. However, these have limitations, and can require a degree of muscle control that might be difficult for some people. For example, Stephen Hawking wasn’t able to use eye-tracking software due to drooping eyelids and other people find eye-tracking technology tiring. It’s the algorithms for translating those signals and making letter selections that the team members have been improving. They had tested individual components of the updated technology in prior monkey studies but had never demonstrated the combined improvements in speed and accuracy. “The interface we tested is exactly what a human would use,” Nuyujukian said. “What we had never quantified before was the typing rate that could be achieved.” Using these high-performing algorithms developed by Nuyujukian and his colleagues, the animals could type more than three times faster than with earlier approaches. 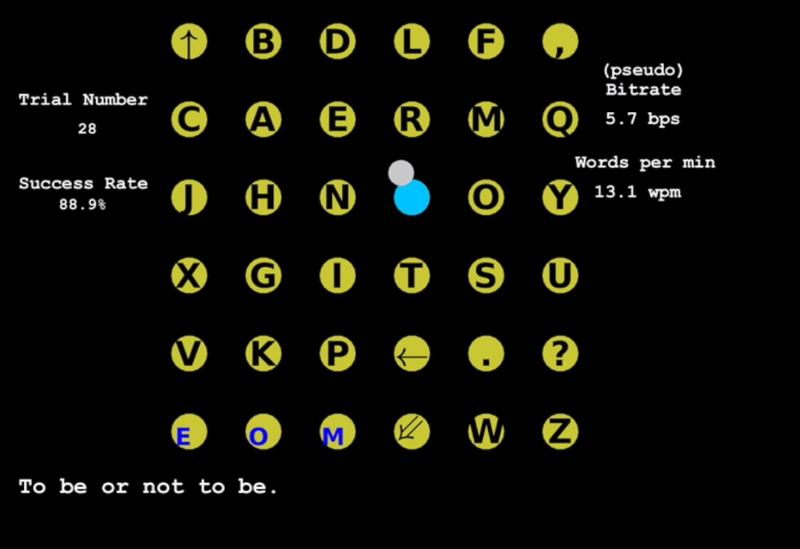 The monkeys testing the technology had been trained to type letters corresponding to what they see on a screen. For this study, the animals transcribed passages of New York Times articles or, in one example, Hamlet. The results, which are published September 12 in IEEE, show that the technology allows a monkey to type with only its thoughts at a rate of up to 12 words per minute. Despite that, Nuyujukian said even a rate lower than the 12 words per minute achieved by monkeys would be a significant advance for people who aren’t otherwise able to communicate effectively or reliably. “Also understand that we’re not using auto completion here like your smartphone does where it guesses your words for you,” Nuyujukian said. Eventually the technology could be paired with the kinds of world completion technology used by smartphones or tablets to improve typing speeds.